The gun turret drive on a combat vehicle presents a very complex design challenge. When the vehicle travels over rough terrain, the gun turret drive compensates for the vehicle’s motion and keeps the gun pointed precisely at its target with 99.5% accuracy. 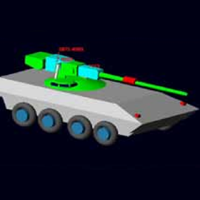 In the past, General Dynamics Land Systems (GDLS) engineers used separate simulations to evaluate different aspects of the gun turret drive design, such as the rigid body structures, flexible bodies and control system. But engineers were not able to evaluate the performance of the gun turret drive as a complete system until they built and tested prototypes. In the last few years, GDLS engineers have begun using a multidisciplinary-based co- simulation process to model the operation of the gun turret drive system while taking into account all of the key physics involved in its operation. The centerpiece of this simulation effort is the use of Adams dynamics software to model the rigid bodies, nonlinear joints and contacts in the gun turret drive. Create the multidiscipline model for the gun turret drive. Early prediction of the jamming condition in the gun turret drive. In this highly complex weapons system, the ability to account for nonlinearities is critical to accurate simulation. The key advantage of Adams is that it accounts for the nonlinearities in this system through its ability to model nonlinear on/off contacts, large displacements associated with part deformations and nonlinear materials.